Beginning from concept and design to literally delivering your message, Integ Does it all. As a highly trusted partner for financial institutions, we understand the need for quick turnarounds and superior work. Our high-security accreditations and state-of-the-art technology in offset and digital printing offer exceptional quality across a variety of departments. The Integ difference is in the details – integrating solutions that guarantee a winning combination for every project. Consult with our Creative team to identify marketing campaigns and branding ideas. We can help you craft the message you want and make sure your story is heard. Ensure your project prints at the highest brilliance with flawless color and crystal clear images as our prepress experts check the details. Preflight each project to anticipating issues before they hit the press. 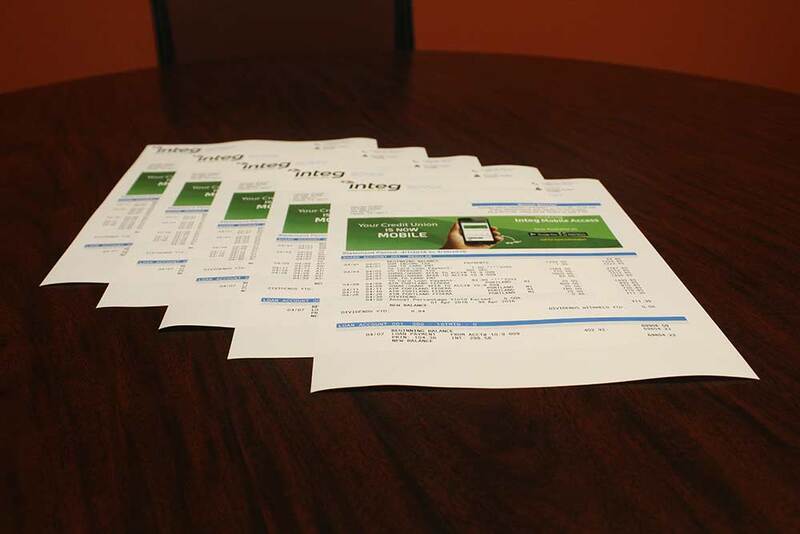 Deliver your message to your customers hassle-free with Integ’s mailing and fulfillment services. Targeting a new audience? Need something that makes a really big impact? Environmental Graphics goes larger with many options like way-finding signage, pole banners, wall murals, concrete signage and more. Looking to make a lasting impression? Our Promotional Products division offers literally a million ways to reach your audience. Looking to outsource your statement printing and mailing? Our distinct processes and technology integrate with your own system to make statement printing plus fulfillment a seamless and secure part of your everyday business. Most importantly, Integ maintains current SSAE 16 Certification, assuring you of the highest security levels when handling your sensitive information. In an age where security is a paramount issue, Integ strives to be as secure as possible, so that you (and your customers) can rest easy. We offer custom statement designs and inserts as well as the best postage rates around. For more information, contact our statement printing department at 254-722-6548 or fill out the contact form below.